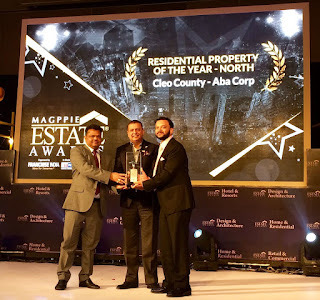 New Delhi, 10 February 2017 NCR based ABA Corp has been awarded by the 9th annual Estate Awards for their marquee project, Cleo County. The township wins the award for Best Residential Property of the Year North India. ABA Corp continues to create world class projects / townships in the NCR region and no compromises are made in presenting to the discerning home buyer an occasion to choose a lifestyle which is in sync with their personality and way of life. Estate Awards by Franchise India are one of India’s leading and prestigious annual awards celebrating the reward excellence to the individuals and companies who have significantly impacted the real estate market in the past. Winning this award is an achievement which has further strengthened the company’s resolve to provide best of the world in the residential property to its customer. Cleo County with its Egyptian theme based design has been one of the most ambitious projects of ABA Corp, where luxury living is redefined with modern architecture, accentuated with unsurpassed quality and design. In a growing economy and a booming real estate market ABA Corp has been able to carve a niche for itself with its core focus on servicing the evolving Indian buyers. The 25 acres of property is home to one of its kind amenities like the First five level cascading swimming pool with a Skywalk in India, a Mist garden which calms and cools your senses and India’s biggest child play area called Little Pharaoh Land with seven play areas including a Mini water theme park, a dedicated trampoline area, and sand pits for children etc. Cleo County offers an opportunity to live like royalty and experience the wonders of luxurious living. Cleo County provides an opportunity to experience the charm of International aesthetics, by introducing the concept of theme landscaping and customized lifestyle experiences, synonymous with a resort. The project is a classic representation of all elements which makes it a project of global standards, sustainability being one of the main factors which elevates the project to an international level. ABA Corp has utilized the latest technology to weave an environment friendly lifestyle with modern design. About ABA Corp: ABA Corp. is one of the leading real estate conglomerates. Over the last 25 years, the group has left its mark with a number of residential apartments and commercial complexes including Orange County, Olive County, Cherry County and Cleo County etc that are today landmarks in their respective areas. These apartments and complexes are the cornerstones of aesthetic design and quality construction that set this group apart. The group believes in conceptualizing the unconventional without compromising on quality and aspires to create awareness about making a “lifestyle choice “ by Inspiring the “middle Class “to reach for the stars and live life king size.